Chinese Arts Alliance of Nashville is hosting its annual World TaiChi & QiGong Day at the Dragon Park, Fannie Mae Dees Park, on 4/27/19 from 10 AM to noon. It is a free event, open to the public. All ages are welcome. Workshops and demonstrations will be presented. Wear your work-out outfits and prepare for a hands-on experience. Presenters are Dr. Cindy Hui-Lio, Joe Rea Phillips, Rusty Rust, Peter Hodes, Peggy Watson, Steve Heath, Robert Abell, and Jen-Jen Lin. What Is QiGong? Pronounced chee gong, QiGong is a practice that involves a series of postures and exercises including slow, circular movements, regulated breathing and focused meditation. April 27 is also the Music City Marathon Day, and NFL Draft event; please anticipate some roads blocks and traffic. Practicing TaiChi/QiGong is a life-time journey. It is never too late to learn TaiChi and QiGong. It is a gentle exercise, and a way to fitness, wellness, and health! For Preview video, please click here. In-depth TaiChi Workshop Series: #1 "The Essence of Taijiquan"
Chinese Arts Alliance of Nashville is hosting a "In-depth TaiChi Workshop" series that to respond to the demands from Taichi learners in Nashville to have a in-depth learning and discussion of Taichi. The first workshop in the series is "The Essence of Taijiquan" will be instructed by Joe Rea Phillips. This workshop is open to the public, and TaiChi learners of all levels. Joe Rea Phillips has a long history of practicing TaiChi and martial arts, especially in Chen Style TaiChiChuan, or Taijiquan. Let's the effort to promote TaiChi and QiGong in our community, and advance personal learning about TaiChi and QiGong. The minimum of the class size is 5. The maximum class size is 12. Register early to secure your spot. Brief introduction of the instructor: Joe Rea Phillips has trained in Chinese martial arts for over 40 years. He has Black Belts in Northern Shaolin - Kickboxing, and Wing Chun before beginning his training with James Cravens in 1984 in the Chinese Boxing Institute International where he has been awarded Teacher Certifications in Chinese Boxing, Pa Kua Chang, and Tai Chi Chuan ( Yang and Chen styles ) In 1994 Joe Rea Phillips received the honor of becoming a “Senior Student” of James Cravens. In March, 2012 Sifu Phillips traveled to Chenjiagou, China ( the birthplace of Tai Chi ) to become recognized by Grandmaster Chen Xiaowang as a 20th generation “Disciple”, which connects him to the lineage of Chen Family Tai Chi Chuan. He has also trained with masters such as Tao-Ping siang ( Yang style ), Chen Zhenglei, Chen Xiaoxing, Chen Quanzhong, Chen Yingjun, and Chen Bing. He has served as the Faculty Adviser and Instructor to the Vanderbilt University Kung Fu Club for 28 years. In 1998 Phillips created a course at Vanderbilt University titled “Tai Chi for Musicians” that he taught for 20 years in helping musicians and other students deal with stress. What should I wear at the workshop? Please wear loose and comfortable outfit. Please wear flat indoor shoes, or socks for the workshop. Shoes wore for outdoor is not allowed. What should I bring for the workshop? Please bring your own water bottle. Water can be re-filled at the entrance of the studio. No, there is no refund policy. Yes, the registration is transferrable. Please do forward the transferring person’s name and contact to ChineseArtsAlliance@gmail.com. A Liability release form also needs to be signed ahead of time by the new person. Mr. Jack, owner of Lucky Bamboo, the Best of Nashville Chinese Restaurant (2015-18), will showcase a special Chinese dinner just for us. Mr. Jack presents a Chef’s Table. Come taste the best of Chinese cuisine and sample dishes not even found on the menu. No substitutions. No choices. No decisions. Just enjoy! So if you are ADVENTUROUS and would LOVE to try different Chinese dishes, this is for you...but if you have food allergies, are vegetarian, vegan or called a picky eater, this is NOT for you. Chinese Dining Adventure #38 is on May 6th, Monday, at 6:30 p.m.
On-Line Advanced ticket purchase is required by Friday, May 3rd, 2019. Purchase your advanced reservation here! If you and your friends order tickets separately and would like to sit at the same table, please email us the info by Friday, May 3. $25 includes tip, multi-course dinner, tea & a small portion will go to Chinese Arts Alliance. This is the best authentic Chinese multi-course Chinese food in Nashville! It's a fun event to meet and spend time with friends and enjoy magnificent authentic Chinese food. At the same time support Chinese Arts Alliance's wonderful arts and cultural programs throughout the year!! -What are my parking options getting to the event? There is a free parking lot in front of the restaurant. There are plenty of parking spaces. Yes. Please do e mail us whom you transfer to by Friday May 3rd. -What time should I be at the restaurant? The dinner is served at 6:30 pm. Please be there around 6:20 pm to be seated, chat with friends, drink a sip of tea, and relax. -What if I would like to sit with my friends at this event even we bought our tickets separately? No problem. Just send us an e mail whom you will like to sit next to at the same table by Friday May 3rd. Love to have you joining us! Great food, great company, and enjoyable evening! Join us for this spectacular multi-course Chinese dinner on 4/1/19 at Lucky Bamboo! Advanced ticket purchase is required by Friday, March 29, 2019. Chinese Dining Adventure #37 is on April 1, Monday, at 6:30 p.m. If you and your friends order tickets separately and would like to sit at the same table, please email us the info. $25 includes tip, multi-course dinner, tea & a small portion will go to Chinese Arts Alliance. This is the best authentic Chinese multi course Dinner in Nashville! Yes. Please do e mail us whom you transfer to by Friday March 29. The dinner is served at 6:30 pm. Please be there around 6:15 pm to be seated, chat with friends, drink a sip of tea, and relax. No problem. Just send us an e mail whom you will like to sit next to at the same table by Friday March 29. Click here for a video! CAAN’s contemporary dancers, Sally Bigham, Pegah Kadivar and Jen-Jen Lin will present a newly composed dance and present at 2019 International Women’s Day at the Parthenon in Centennial Park, March 8th, 2019, at 5:30 PM. The entire event starts at 5:30 PM. We are scheduled to perform at 6:50PM; right after the Opening Ceremony at 6:30 PM. The entire event ends at 10:30 PM. This even , “The International Women’s Day,” is organized by Girl, unKnown Inc. We are honored to be a part of the celebration. It is a free event. All are welcome. The Premier International Women’s Day event in Nashville will be held on Friday, March 8 at The Parthenon in Centennial Park at 5:30 pm. Come out and celebrate people of all shapes, sizes, colors, and creeds with us at the 2019 International Women’s Day Nashville! Advanced ticket purchase on-line is required by Friday, 3/1/19! Chinese Dining Adventure #36 is on March 4, Monday, at 6:30 p.m.
Advanced ticket purchase is required by Friday, March 1, 2019. Click "Ticket Quantity" and purchase. $25 includes tip, multicourse dinner, tea & a small portion will go to Chinese Arts Alliance. This is the best authentic Chinese multi course Dinner in Nashville! Yes. Please do e mail us whom you transfer to by Friday March 1. No problem. Just send us an e mail whom you will like to sit next to at the same table by Friday March 1. Chinese New Celebration is on the go! Chinese New Year Celebration traditional celebrated for 15 days, from Lunar Calendar Jan 1st to Jan 15th. Chinese Arts Alliance of Nashville will present Chinese New Year Celebration at Plaza Mariachi on February 16 from 4:30 PM - 6:00 PM. This event is co-sponsored by Plaza Mariachi. This is the first time that CAAN brings and shares the Chinese New Year cheers and excitements at the plaza on Nolensville Pike, Nashville! Music, songs, Chinese yo yo, lion dance, dragon dance, Bamboo Dance, Asian food, arts/crafts and dance. We invite you to join us to have a fun late afternoon of the celebration! Free Registration, please click here. This assists us to plan the event. Thank you for joining us! Welcoming the Chinese New Year in 2019, Chinese Arts Alliance of Nashville (CAAN) is hosting an exquisite Chinese New Year Banquet. Special menu includes cuisines from various parts of China. Chinese New Year Banquet is an elegant ten-course event showcasing Lucky Bamboo China Bistro food artistry in celebration of the Chinese New Year complete with CAAN’s silent auction that supports CAAN. Its mission is to promote the awareness, understanding, appreciation, and enjoyment of the Chinese visual arts and performing arts. Tickets are available Online here. Come join us and make your reservations early! Complete info is listed at Eventbrite ticketing site: click here! Chinese Arts Alliance is hosting the annual Chinese New Year Celebration at Hillsboro Village. The date is Feb 9, Sat from noon to 3 PM. The program includes arts & crafts for children, Chinese dance, martial arts, bamboo dance, Chinese Yo-Yo, Juggling act, Chinese music & songs in addition to Chinese lion dance and dragon dance. Chinese Arts Alliance of Nashville is a nonprofit arts organization that brings art and culture to our city and our community. We like to build connection, creativity, and community. Our collaborators are the Office of Community, Neighborhood, and Government Relations (CNGR) at Vanderbilt University, MLK High School Chinese Language Program, Borderless Arts Tennessee, Playing By Air, Phialva - Zomi Bamboo Dance, Metro Parks Dance Department, Vanderbilt Juggling and Physical Arts Club, MBA Asian Club, and Nashville Chinese School. Our finale will be a Dragon parade with families through the village. We dance with red streamers and make noise to bring blessing to everyone. The venue is Vanderbilt University’s Corner Park between 21st Ave. S. and Blakemore Ave. provided by Vanderbilt University as our venue, and free parking is provided by Cornerstone Credit Union. In case of rain, we will have Vanderbilt’s Recreation Center as back up site. Volunteers are needed! Make a difference, please volunteer. Click here to sign up! We thank you. Chinese New Year Celebration at Hillsboro Village is on Feb. 9th,noon to 3PM. It will be a splendid Chinese New Year celebration for the Year of the Pig! Behind each event, there are volunteers giving their time and hearts to make it a success. We appreciate all CAAN's past volunteers! We need more helps with setting up, helping run children's art tables, managing traffic, and closing up. Will you sign up to help? Each volunteering slot is 2 hours or 3 hours, between the hours of 9 AM to 4 PM. Chinese Dining Adventure #35 is on December 3, Monday, at 6:30 p.m.
Advanced ticket purchase is required by Friday, Nov 30, 2018. Purchase your advanced reservation here! Click "Ticket Quantity" and purchase. Yes. Please do e mail us whom you transfer to by Friday, Nov 30. No problem. Just send us an e mail whom you will like to sit next to at the same table by Friday, Nov 30. Great food, great company, and great fun! Mr. Jack, owner of Lucky Bamboo, the Best of Nashville Chinese Restaurant (2015-17), will showcase a special Chinese dinner just for us. Mr. Jack presents a Chef’s Table. Come taste the best of Chinese cuisine and sample dishes not even found on the menu. 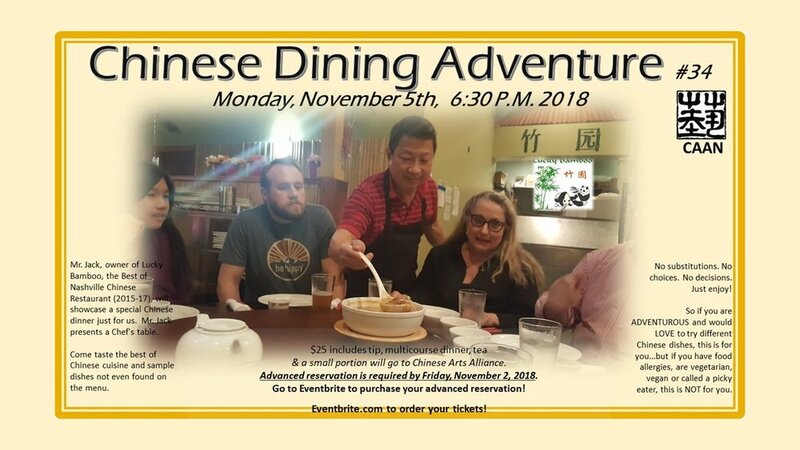 Chinese Dining Adventure #34 is on Nov 5, Monday, at 6:30 p.m.
Advanced ticket purchase is required by Friday, Nov 2, 2018. © Copyright 2010 - Present, All Rights Reserved.